I feel bit relieved today, after finishing the presentation for my MBA subject “Professional Communication”. The entire class was grouped into 9 teams of 8 students, and we were suppose to select a topic, and a theme (core argument) of our choice, and make a convincing presentation to an assumed audience of our choice. Our group, opted for “arguing in favor of Non-state Universities in Sri Lanka”. Personally, I believe we did a decent job with the presentation, and hopefully the nights I spent sleepless, in preparation for the presentation would pay off. But more than that, what’s important is the lessons we gathered by this interactive class room activity. Dr. Uditha Liyanage is our course instructor for this subject, and there were many good points made by him, about making effective oral presentations. One key learning from the whole exercise for me, is the lesson about "Core point, and supportive points". Many of us don’t understand the difference between making a PowerPoint presentation, and writing an article on Microsoft Word. Why Microsoft wanted these two applications as two separate things, is because of an obvious reason! 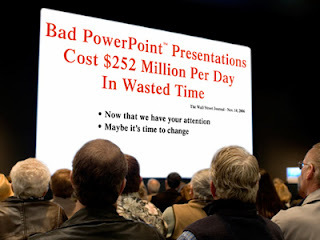 In fact, most of the time what we do is writing an “article” into a PowerPoint show, and lable it as a “presentation”. But, if you are trying to create an effective presentation, using PowerPoint, the rule number one is to “keep only the essence”. And that essence should support the core point that you are going to convince. By doing so, you can keep the audiance always active and engaged. But on the other hand, if you stuff in too many inoformation to your presentation slides, it will lead to clutter, and ultimately leading your audiance, for a small nap. Why do you want to make a presentation? Because, you want to convince your target audience, with your core message, by making use of powerful communication tactics including tone of voice, visual aids, and other Para-verbal communication. On the other hand, if you want to make a detailed explanation to your target audience, what you can do is writing an article, containing all the details. But, most of us do it wrong, by stuffing too much of information into PowerPoint slides, and making the PPS an “article” itself! Once again, the key learning point! PowerPoints should not be cluttered, and it should contain “Only” the things that really support your core point of the presentation. If you think otherwise, please use Microsoft word instead. PowrPoint is not for you.